Last and current week were the most live and dynamic in comparison with several previous. 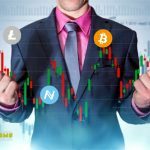 New impulses of downward trends were formed and developed on the cryptocurrency market. The market is still in a downtrend phase and the "bottom" is still far away, but a short-term stop or pullback is already "just around the corner". One of the most interesting was the situation in the dynamics of Ethereum. ETH/USD developed one of the fastest and most stable drop microtrends. On a 4-hour chart it is possible to see orientation of the short-term downtrend to the line of support of the long-term channel of decrease at a mark of $175, but it, perhaps, prospect of several weeks. In the short term, considering the formation of MACD and Stochastic convergences, it is possible to start the development of a corrective uptrend. Local resistance to the downtrend is at $ 298. Its breakdown can open the quotes to the resistance line of the upper projection channel - $ 308. The long-term, medium-term and short-term trends of Bitcoin Cash quotations remain a downward trend. The main milestones in development of the next impulse of decrease were a pullback from the resistance and breakdown of fractal support for $600 which was strong resistance. 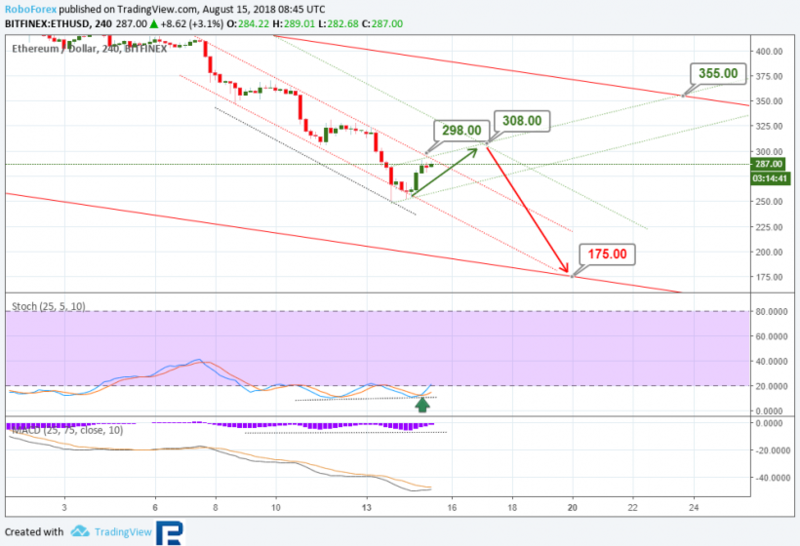 Short-term downtrend channel looks quite stable and may indicate the potential for a decline to a psychologically important level of $ 300. But, if you look at the charts of Stochastic and MACD indicators, you can see the convergence and the Golden Crosses. These factors indicate the beginning of a short-term rollback. Its immediate goal may be resistance of the current corridor of decline at $ 565, perhaps - and about $ 600. 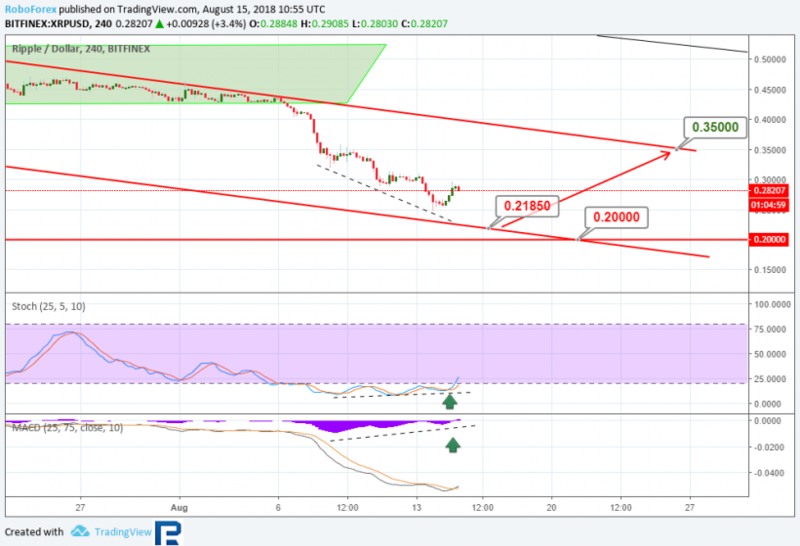 Last week the technical picture EOS showed the beginning of breakdown of the line of support near a mark of $6,22 which at the moment is key resistance. To date, we see that there was an acceleration of development of the short-term downtrend after breakdown of support line of the previous downward channel. 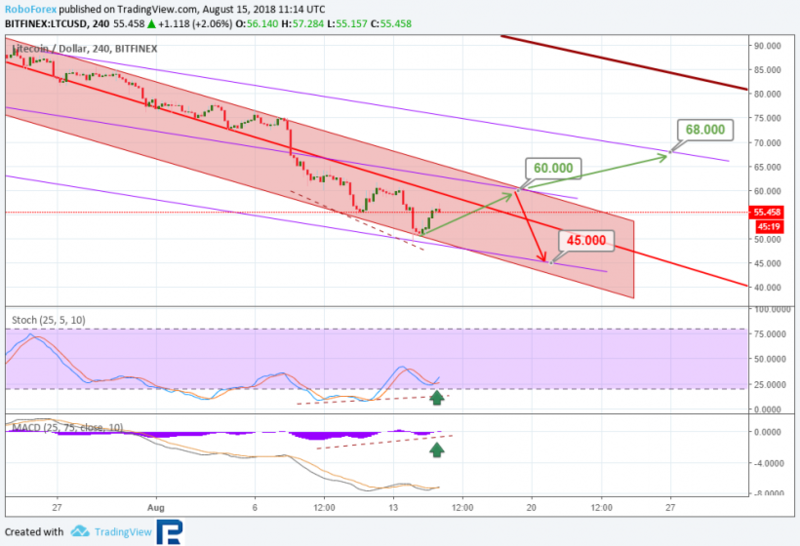 LTC/USD after testing the resistance line of the medium-term decline channel returned to the previous corridor. Litecoin demonstrates the approach to the support of the current channel. 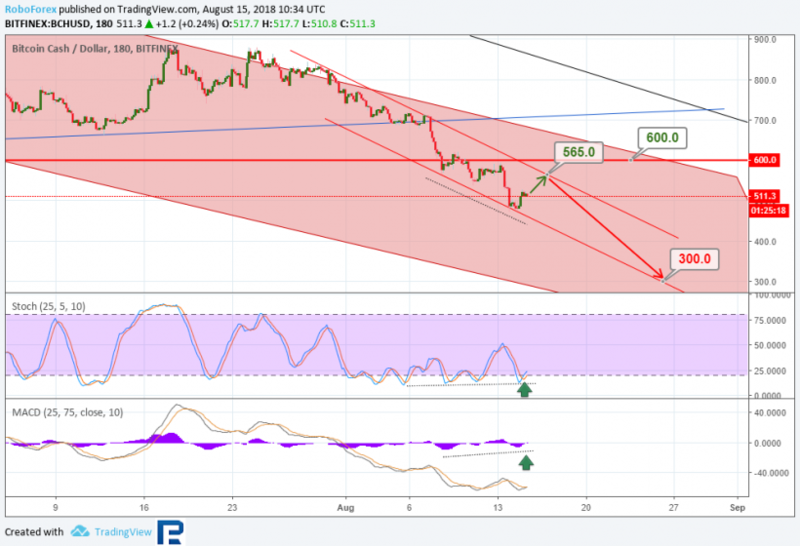 There is the formation of convergence and Golden Crosses on the indicators Stochastic and MACD, which together indicates the possibility of pullback to the resistance line at $ 60. Its breakdown may open the door for quotations to around $ 68. But in the case of a rebound from local resistance, we can expect a new impulse to decline to the support line at $ 45. Ripple dynamics retains a downward trend. The next impulse of the downward trend is approaching the support line of the medium-term corridor - $ 0.2185. But market is approaching the psychologically important fractal level of $ 0.2000. 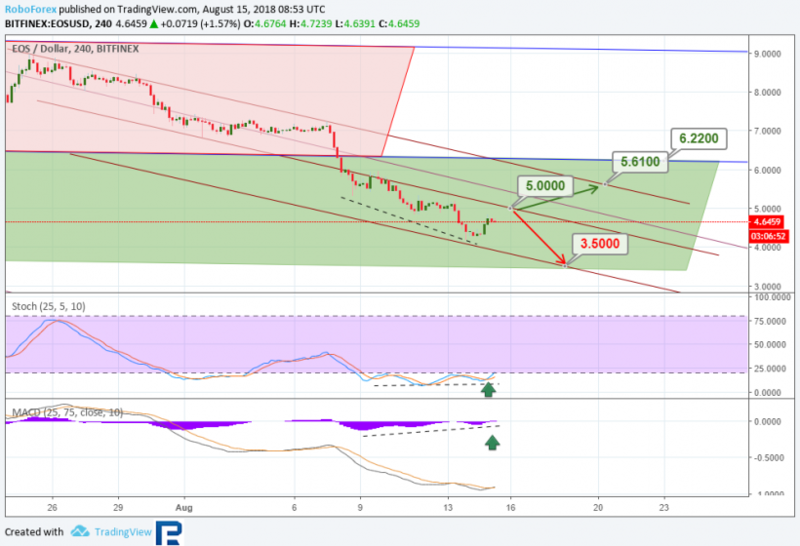 After support line, we may expect the development of a corrective uptrend to the resistance of the current channel at $ 0.3500. © 2018 bit.news | queries 216, for 0.430 sec.